Hello! Several people have expressed interest in Full of Patterns, so I asked them if it is possible for people living outside Japan to purchase the PDF patterns. 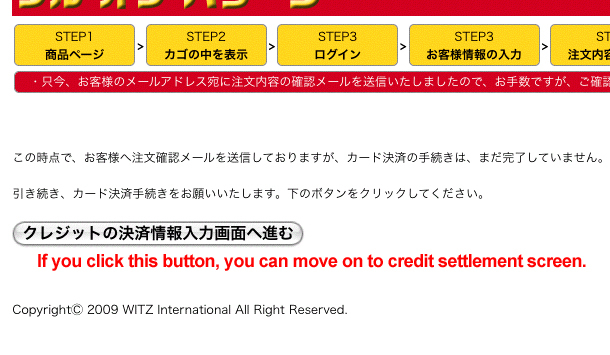 They replied immediately and sent these step-by-step screen captions with English explanations (in red) on how to order. It might be a bit of a hassle, but their patterns are good so it is worth to try. I have made several patterns from them that you can see here. 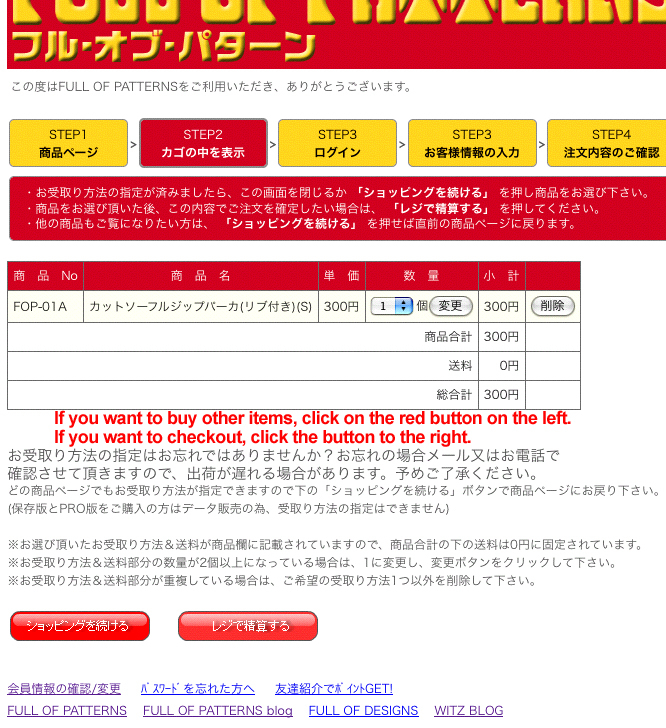 Full of Patterns sells patterns in paper and PDF version but you can only purchase the PDF patterns from outside Japan. 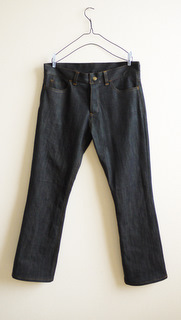 They seem to focus more on menswear pattern with on-trend styles: selvedge jeans, sarouel pants, jackets etc. There are also kidswear, which mostly are the kids version of their menswear patterns, and a bit of womenswear. – The patterns are in Japanese. There are a couple of diagrams but not a full step by step instructions. But I believe if you are an experienced sewer, you won’t have too many problems. 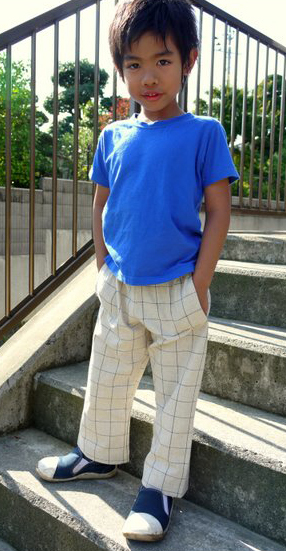 Some of the patterns, like drawstring pants, are easy and are suitable for beginners. 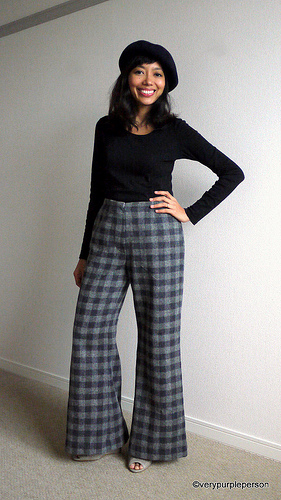 – The patterns are not multi-size, you have to choose your size before purchasing. They also sell multi-size patterns but of course more expensive. – Because it is only one size, they can show both the stitching lines and the seam allowances. – The payment option is by credit card. – I find it very helpful to browse the site using Google translate extension on Chrome. 1. Go to the Full of Patterns website, or you can click one of the options below. 2. Browse the patterns and choose ones that you like. This is an example page of the pattern. See the four columns with the title on blue background? The first one is size chart and finished measurements. 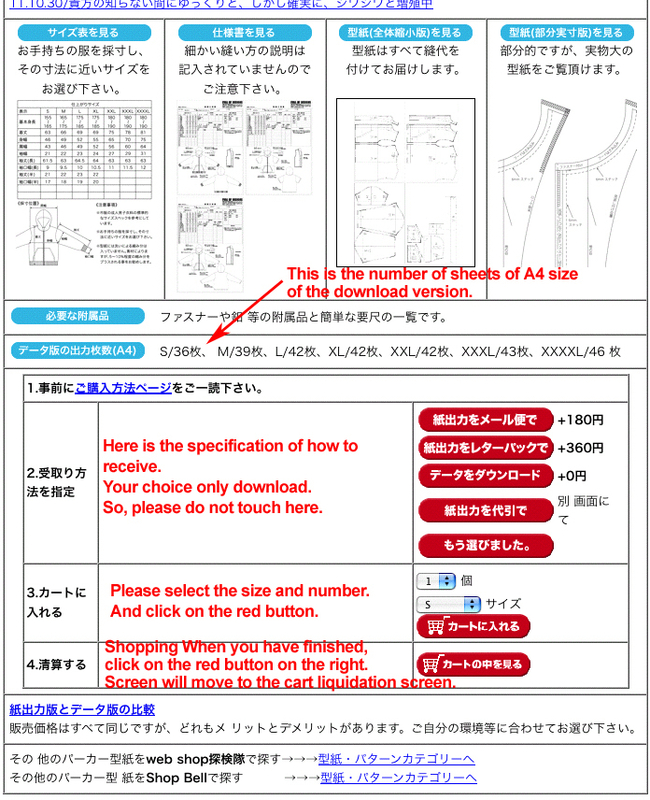 The second one is some example of the instruction pages. The third one is the pattern pieces. The fourth one is an example of the pattern in actual size. Follow the instructions in red. 3. This is your shopping cart. You can continue shopping or go to checkout. 4. 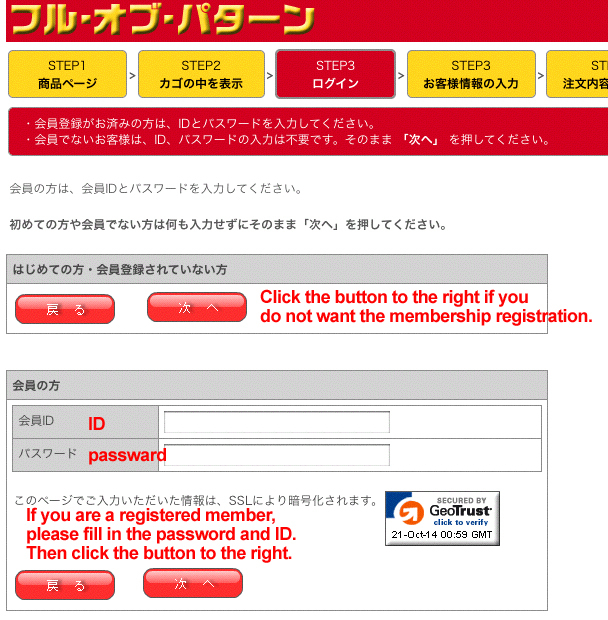 You can register as a member but it is not necessary to buy the patterns. 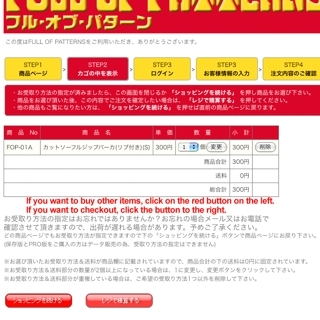 They do give points that you can collect and use for the next purchase if you choose to be a member. 5. Fill your information in this page. Your payment option is only by credit card. For the telephone number, postcode, and address, put the ones as shown in this screen caption. 7. 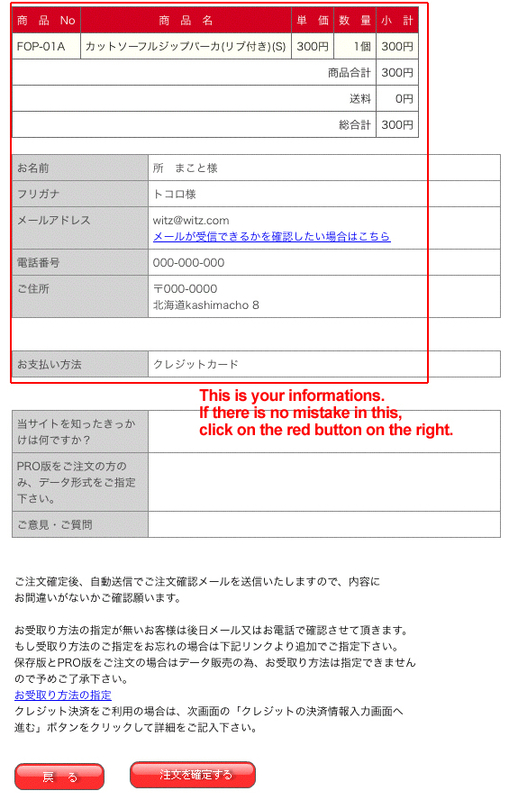 Go to the credit card information page. 8. Done! 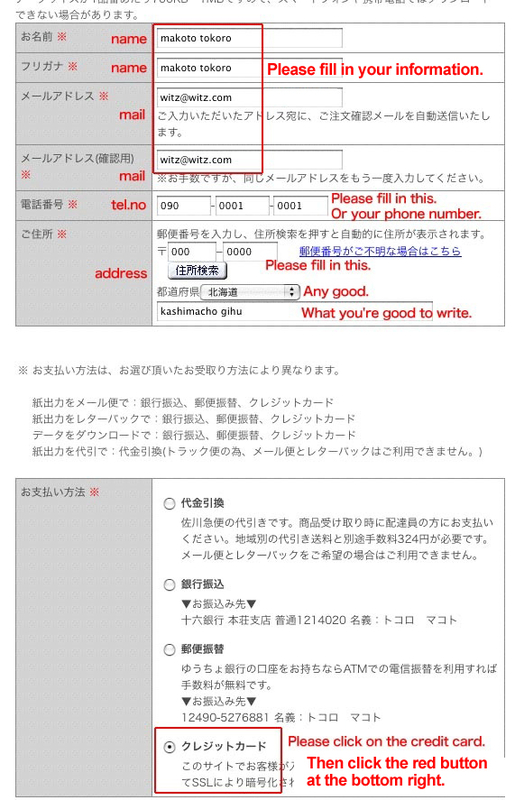 They will send order confirmation to your email in Japanese, you don’t have to do anything with the email so don’t worry. The link to download the pattern will be sent to your email in 1-2 days. PS: I’m not affiliated with Full of Patterns and just sharing the information that they gave me.